Scientists and conservationists of the Leibniz Institute for Zoo and Wildlife Research (Leibniz-IZW) and WWF-Vietnam captured photographs of one of the rarest and most threatened mammal species of Southeast Asia, the large-antlered muntjac (Muntiacus vuquangensis), in Quang Nam province, central Vietnam. Quang Nam – 23rd May, 2018 - In November 2017, under a biodiversity monitoring and assessment activity supported by the US Agency for International Development (USAID), scientists and conservationists of the Leibniz Institute for Zoo and Wildlife Research (Leibniz-IZW) and WWF-Vietnam captured photographs of one of the rarest and most threatened mammal species of Southeast Asia, the large-antlered muntjac (Muntiacus vuquangensis), in Quang Nam province, central Vietnam. 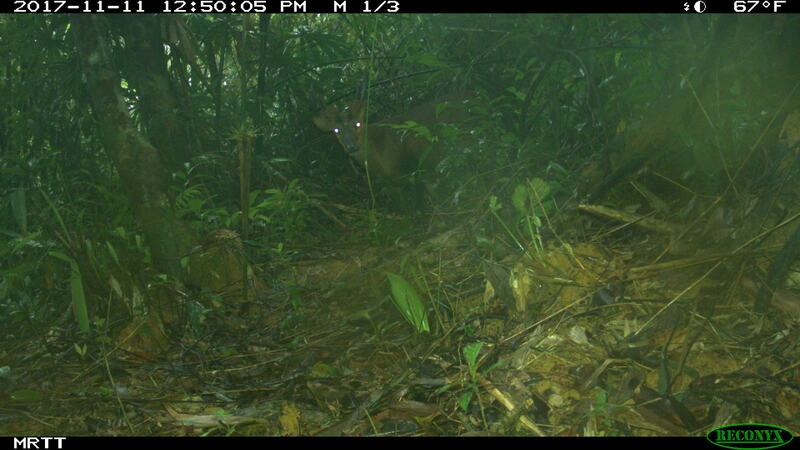 Prior to this milestone, this species had only been camera trapped in three protected areas in all of Vietnam since the year 2000. The new records from Quang Nam - which include photographs of both a male and a female - provide new hope for the continued survival of a species that is on the brink of extinction. 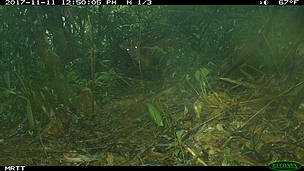 In addition to large-antlered muntjac, other camera trap surveys funded by USAID also documented other conservation priority species including Owston’s civet (Chrotogale owstoni), Asiatic black bear (Ursus thibetanus), Annamite striped rabbit (Nesolagus timminsi), and pangolin (Manis spp). “Finding these rare and beautiful species gives new hope for Vietnam’s precious biodiversity treasures,” says Nguyen Van Thanh, who led the field survey. Thanh is both a PhD student at the Leibniz Institute for Zoo and Wildlife Research and a WWF Russell E. Train Fellowship recipient. 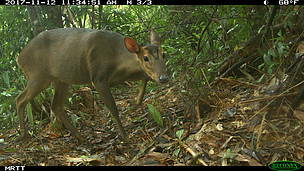 “Although populations of all ground-dwelling mammals and birds have declined from snaring, our results show that the forests of Quang Nam province still harbor globally-significant biodiversity” Thanh adds. The findings of this study will help the Forest Protection Department of Quang Nam to develop better management and law enforcement plans to save these species and their habitats.